The AED Trainer 3 reflects the unique functionality of the Philips HeartStart FR3 AED and provides a realistic training experience for emergency responders to deliver optimal therapy when facing cardiac arrest. 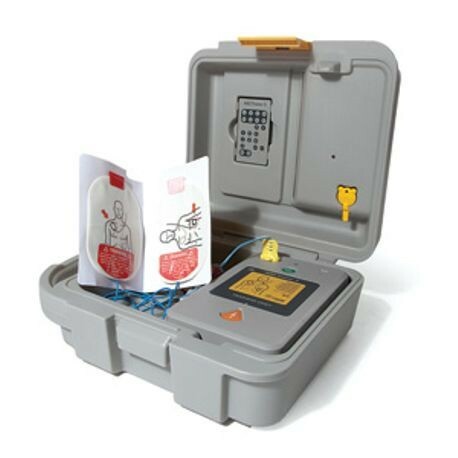 The AED Trainer 3 is configured with eight real-world scenarios that have been developed in accordance with internationally recognized responder programs. They are AHA and ECC 2010 Guidelines compliant. Many parameters on each scenario can be easily configured to conform to local protocols or future Guidelines updates. The instructor can change scenarios by pressing the buttons on the device or by using an optical remote control. The remote control lets the instructor pause, change, or introduce new challenges during each scenario.